It appears some JPD cruisers stored behind the old satellite office on Farish Street were mighty tempting targets for some thieves. That goes to show you that thieves gives NO F%#& 's about JPD. The system is broken in Jackson and Hinds County.This Monday go to the Circuit Court house and view all the empty courtrooms. This has been going on for years. Thieves don't care about Police anymore the RESPECT is gone in the city. That’s just another radical new plan from the mayor. Let this be a reminder to those hillbillies in Niknar. If JPD had left any weapons or body armor it would be gone too. This kind of stuff has been going on for so long it's gotten hard to make up jokes about it. I taking up a collection for a billboard on I-55 to put the above picture on it. The fine mayor will certainly have to respond. To paraphrase "George Hanson" (the character in "Easy Rider" played by Jack Nicholson), "You know, Jackson used to be a helluva good city." What is this new genre of artwork? It’s so edgy. These are headed to the auction house boys, if you put all 3 of them together you couldn't make a car that runs. What is the value of stock rims and tires from a Crown Victoria? This makes no sense. Those were cluckers, the insurance claim won't buy a good set of tires. Jackson is not swirling around the toilet . . . my hometown was flushed down the drain years ago. Hell, even Zoo Brew is now dead due to lack of sponsors. NOBODY in their right mind will venture into into that quagmire of a 'City' until things change. Borrowing car parts without first asking is perfectly acceptable and commonplace in a dignity economy. They's lots of old Crown Vics with a rubber patch over the antenna hole and a police interceptor engine running the streets in Hinds and Madison Counties. Tear drop light too. These wheels will complete the look of authenticity. It ain't about they value...It's about the 'real look'. Chick magnets. Inside job. There are at least 17 brand spanking new white Ford Explorers with the City of Jackson PoPo decals including Baby Choks big orange skripe over at the back 40 lot of Grey Daniels Ford in Brandon, across from the Toyota and Nissan dealerships. They've been there for months. @6:16 PM - You want to bet that JPD hasn't paid their bill? This same thing happens in all governmental agencies when equipment is taken out of service or waits to be scrapped. It just looks real bad when it's police cars getting chopped. Well the truth is that we as LEO only have to worry about out stuff getting broken into in Jackson. Not 1 report of someone stealing wheels or breaking into a police vehicle outside of Jacktown. It’s a lawless and crap city. There will never be any good come from there. It's been pointed out that this can NOT be a picture of Jackson with no potholes and those street lamps. Also, the last vehicle on the right does not resemble a JPD vehicle. None of the wrecker logos or car logos can be seen. So, although it's a neat story, it's fake news. However; it's now been reported that the location is in front of the train/bus depot, shot from the King Edward. Nobody would dare leave a vehicle at the train station so Baby Chock had these three decoys strategically positioned nearby to thwart criminals. So much for that plan. Did Chuckway order the towing from Iceland? 2:25 PM The last car is JPD car with different type of graphics. I want to say it has the crime stoppers graphics. There are few of those cars. The pictures is down by Union Station. Any fool would know it would be much cheaper to either put wheels on the cars where they sat or employ the use of a lowboy or car hauler instead of paying for three wreckers. But, wait, the wrecker service is probably on contract with the city so it's not real money anyway. Who was the idiot that thought this was a good idea to store 3 cruisers anywhere near Farish Street? This city is so gone. @2:25 PM, the only fake news here is your post. "Sgt. 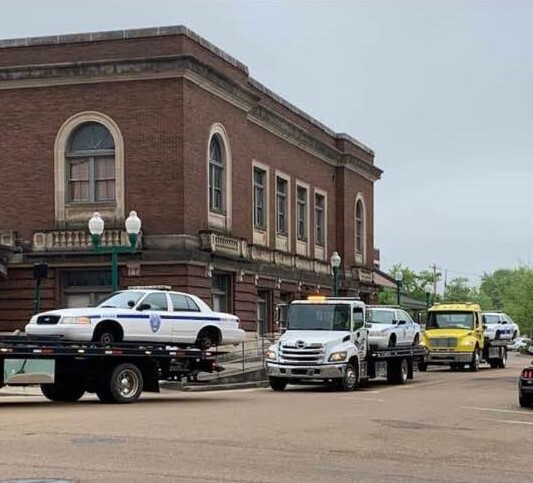 Roderick Holmes said the patrol cars had been parked in the rear of the Police Department Museum on Farish Street at the time of the thefts. It is not clear when the thefts occurred." 12:37 - thank you. I did not know we have a 'police department museum' over on Farish. Is this where Stokes and Chokwe have sent all the portraits of former white chiefs and department staff? That might call for an entirely new thread on the blog.